MAK Center for Art and Architecture L.A.
Rudolf M. Schindlers Studio-Residence was the first modern house to respond to the unique climate of California, and as such it served as the prototype for a distinctly Californian style of design. From 1922 until his death in 1953, the building functioned as both his house and studio. During this 30 year period, Schindler designed the houses and small commercial buildings that today are considered landmarks of the modern movement. 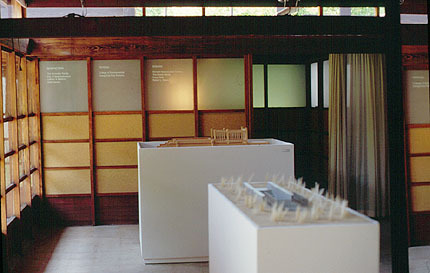 In his own house, Schindler expressed his philosophy about structure and materials most clearly, but the entire site demonstrates his exploration of the relationship of space, light, and form. In this, his first independent design in the U.S., Schindler set forth the basic tenets of his architectural philosophy, which he called "Space Architecture." In this masterwork he established himself as a major figure in the history of the modern movement. Smith recounts how Schindler was born in Vienna, where he studied art and architecture and worked with Otto Wagner and Adolph Loos. In 1914, Schindler moved to Chicago to work with a commercial architectural firm. After this job, he joined Frank Lloyd Wrights studio, traveling in Los Angeles in 1920 to supervise the construction of the Hollyhock House. 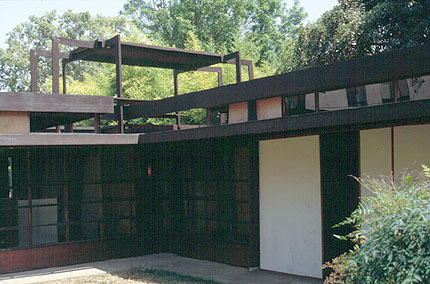 Schindler began his own practice in 1921, designing the house and studio to accommodate two couples: he and his wife, Pauline, and Clyde and Marian Chace. The Chaces left in 1924, but were replaced by Richard Neutra and his family in 1925. Collaboration with Neutra (a former schoolmate from Vienna) produced several modern architectural landmarks: Schindlers Lovell Beach House at Newport Beach, their joint competition for the League of Nations Building, and Neutras Lovell "Health" House in Los Angeles. The Schindler House is located 4 blocks east of La Cienega and 2 blocks north of Melrose on the west side of Kings Road and behind a bamboo hedge. I had no trouble finding nearby on-street parking. Visiting hours are Wednesday through Sunday, 11 am to 6 pm. Closed Mondays and Tuesdays. Regular tours are available on weekends only (weekdays, its a self-guided tour). Special arrangements may be made for groups and tours at other times. Admission is $5.00 for adults, seniors and students. Free to children under 12, and free to everyone Fridays from 4:00 to 6:00 pm and on September 10 (Schindlers birthday); May 24 (International Museum Day); and December 1 (A Day Without Art).